Here’s a treat for nostalgia-loving fans of ghouls, goblins, and massive amounts of chest hair: a list of YouTube’s best ’70s Halloween specials, put together by Metafilter. The list contains a few expected classics, like Vincent Price’s wonderfully campy appearance on The Muppet Show and Dr. Seuss’ nightmare-inducing-to-small-children Halloween Is Grinch Night, and there are also a few PSAs to remind you to check all of the apples you receive this year for razor blades. Remember, sending your child out in a black witch costume on Halloween is tantamount to a death sentence. 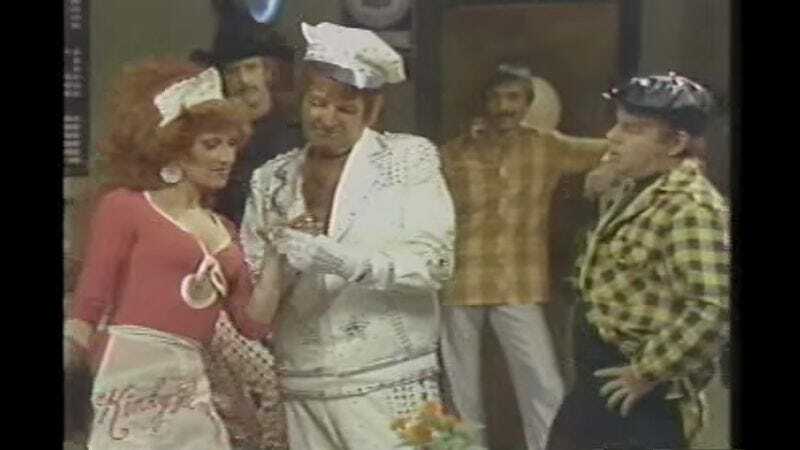 But the cream of the crop is the first entry on the list: The Paul Lynde Halloween Special, an aggressively ’70s amalgam of everything that made the decade what it was, perhaps best exemplified in the moment where Lynde gushes to Witchiepoo from H.R. Pufnstuf and Margaret Hamilton from The Wizard Of Oz about how excited he is to listen to Kiss drummer Peter Criss croak out the band’s gold-record ballad “Beth.” It also features Lynde aggressively hitting on women while wearing what appears to be a white leather, open-chested, rhinestone-covered milkman’s costume, for those of you who own a BeDazzler and still need a Halloween costume.